Now here is the rub.....This year I hosted my first (2) challenges; one challenge I'm doing okay with 2010 Reading from My Shelves Project having read 47/75, but then there is the other challenge: 2010 Books to Read Before I Die, where I have only read 3/20 books. (I'm wondering if it might be bad luck to finish all the books on that list...LOL). In 2010, I signed up for 10 challenges and have completed 6 of these so I'm good with that. So what are my plans for the second half of 2010? I'd love to complete ALL (10) of my challenges, but I'll be content on just going with the flow, and reading whatever book feels right for me. I'm going to try to resist reading all the latest and greatest books, and select some of those great books from years past, that I never managed to get to.....let's see how that goes. 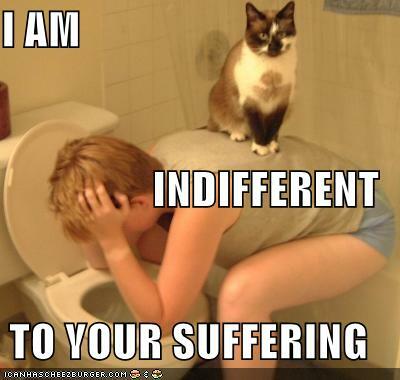 How about you, how are you doing? 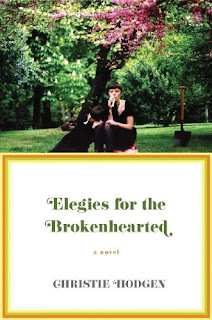 A savvy, spirited, moving, and surprisingly humorous novel in elegies. Who are the people you’ll never forget? For Mary Murphy, there are five: A skirt-chasing, car-racing uncle with whiskey breath and a three-day beard. A “walking joke, a sitting duck, a fish in a barrel” named Elwood LePoer. A dirt-poor college roommate who conceals an unbearable secret. A failed piano prodigy lost in middle age. 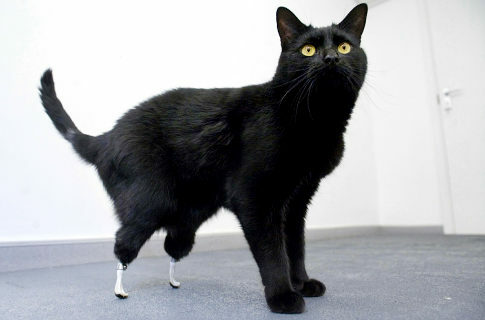 A beautiful mother haunted by her once-great aspirations. In five quirky elegies to lost friends and relatives, Mary tells us the story of her life. We begin with a restless childhood spent following her mother between multiple homes and husbands. Then comes the disappearance of Mary’s rebellious and beloved sister, Malinda. By the time Mary leaves for college, she has no one to write home to, and we follow along on her difficult search for purpose. From a series of miserable jobs to her “reborn” mother’s deathbed, Mary finds hope in the most surprising places. With a rhythmically unique voice and pitch-perfect wry humor, Christie Hodgen spins an unconventional and moving story about identity, belonging, and family. Who doesn't want a flat belly, but did you realize that people with flat bellies are less likely to develop, Type 2 diabetes, heart disease and cancer? 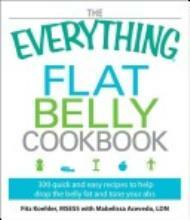 The Everything Flat Belly Cookbook discusses combining a healthy lifestyle and moderate workout routine with recipes that help to eliminate the belly bulge. 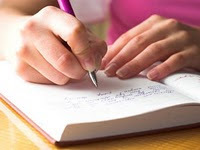 Do you keep a food diary? Most people are way off when they just try to estimate how many calories they eat each day. Tracking your caloric intake is the only way to really know how many calories you are consuming. What about carbs, do you crave them like me? If so, it is recommended that you consume your carbs at breakfast only when you need the energy to fuel your day. Eating carbs in the evening usually ends up as extra fat as we are less likely to burn them off. This book is not a diet book, but rather a book that guides you to start making more sensible eating choices. It also outlines some sensible exercises to strengthen abdominal and back muscles while losing a few pounds by making better food choices. The book has chapters that cover, Breakfast, lunch, snack and dinner menus and recipes. There is a section on salads, a vegetarian, seafood, poultry, and beef/pork section. In addition, there are soups/stews, pizzas, appetizers, dips/spreads and dressings, side dishes, and my favorite: not so sinful desserts. 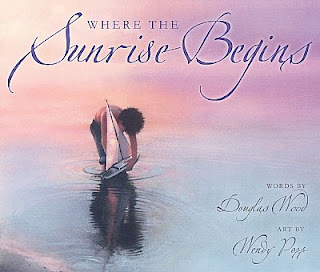 In Where the Sunrise Begins , author Douglas Wood explains in a way that is interesting for children, how the world is always turning toward the dawn of a brand new day, Bringing with the brand new day, is a brand new sunrise. for each of us around the world to enjoy. To correspond with the lovely narrative, are the most gorgeous illustrations by, Wendy Popp. Each illustration features children and or nature. The rich pastels, vibrant orange, and subtle hues will have you in awe; the perfect compliment to this sweet story. If you are not familiar with Wendy Popp's illustrations, you need to check them out: One Candle and Sister Anne's Hands are other lovely examples of her talent. This is a great book for the 3-7 age group, but would be a special treat for parents and grandparents and teachers as well. I admit to wanting to read this book because of all the hype, but we all know that does not always work out to be a good thing. 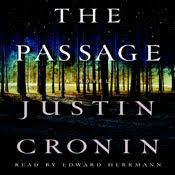 As much as I wanted to like this book, I had to give myself permission to move on to something else after investing a week of my time both reading and listening to about 180 pages or 7 discs of 25 of this audio book set. Scott Brick, the narrator is a very good reader, so that was not the issue. I admit that I was enjoying the parts of the story about little Amy, a little white girl who was left at a convent by her mother who was a prostitute. I also liked the mysterious Sister Lacey, the black nun at the convent who was there for Amy, and seemed to have secrets of her own. What I wasn't into was the whole secret government virus project, and what was to follow. I guess a new population of blood thirsty vampires was a bit over the top for me. Maybe I just lack a vivid imagination, but basically I think this just not the type of story I could ever enjoy reading. BTW: I never read The Stand either. Have you read The Passage ? Did you like it as much as Ti @ Book Chatter or Marie @ Boston Bibliophile? Maybe, you feel more like me, or perhaps, Rhapsody in Books and A Progressive on the Prairie? If you haven't read The Passage yet, do you plan to read it? How I Spent My Weekend! (this was the hub too (3) days ago). Mailbox Monday is hosted by Marcia @ The Printed Page. Hope you had a good week in books! approximately 1,100 comments (but just 69 comments in the 1st - 6 months of blogging!.....starting out is tough! 90+ subscribers, and 50(+) followers. I have all of you to thank for bringing so much more book joy to each and every day. Sometimes I feel like a "slacker" for not visiting you enough or not commenting enough, but the truth is I have so much less time free time now. Many of you know I went back to work full-time, but I still try hard to respond in the comment section whenever someone asks me a question. I also try very hard to visit the blogs of all my faithful followers, in addition to many other blogs I just enjoy. 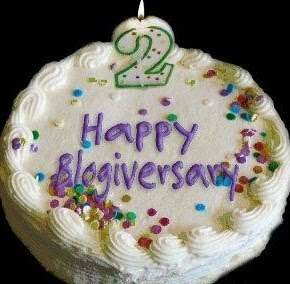 I have met so many wonderful book lovers through blogging. All of your reviews and your posts about books have added to my ever expanding wish list. I'd like to thank all of the publicists who have contacted me and sent me books for review this year ~~ much appreciated. My book stacks have grown from roughly 550 books (last year at this time) to about 740 books right now. The funny thing is, I tend to give the books I've read to friends or donate them to the library book sale, so 95% of the books in my possession are unread! I call them "my retirement stash". I have promised myself to "clean house" once again should the number hit 751 (getting very very close). 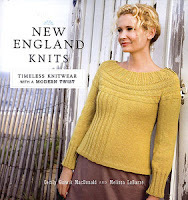 1st Prize - I've been doing a little bragging off and on about my daughters new book, so first prize will be a Signed copy of New England Knits (to be released July 2010). If you are not a knitter, this book would make a great gift for anyone who loves knitting. Seriously, even if you don't knit, I assure you that you will love browsing and find several items to fall in love with ( I got a sneak peek). All of the patterns were designed and knit by the talented Melissa and Cecily. 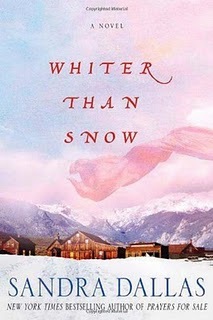 2nd Prize - Brand new Hardcover copy of the 2010 Sandra Dallas novel Whiter Than Snow . It is a great story; I listened to the audio book, and liked it a lot. I don't want to make you jump through too many hoops (just a few). So if you'd like a chance at the giveaways, here is all you have to do. If you are not a FOLLOWER, become one, to be eligible for giveaway and leave a comment with a way to contact you in case you win. OLD followers/subscribers, just leave a comment and a way to contact you. Winners will be drawn at on 4th of July using random.org . All winners will be notified. (You will have (3) days to respond with mailing info, or alternates may be selected). Thanks for your support and Good Luck to everyone. It's been 2 great years! I'm one of the readers who rarely would read the same book twice. In fact when I finish a book, I'll generally give it to a friend or family member, or donate it it the library......but like everything else there are exceptions. Today's Friday Finds, I decided to feature (2) books that I have read twice, and I still have the books for a possible third read...crazy huh? Also, (1) book for consideration that I have not read yet. This book was released in 1973, and is now out of print, but I still have a tattered paperback that I never parted with. 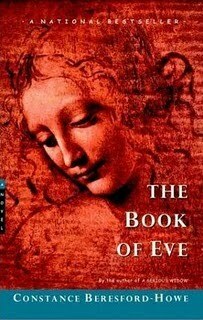 I first read this book in the early 1980's; then again around 1990, a few years after my mom passed away. Why? Because in some ways this story reminded me of her life, but sadly she wasn't brave enough to walk away and ended up dying before my father...still unhappy with her self-imposed situation. Has anyone ever come across this book? I think this book was released in 1998, but it was just such an memorable read; great character development and setting. (amazon)......In 1962 the Marx family of liberal Newton, Massachusetts, is politely discouraged from vacationing at a placid Vermont resort by a thinly veiled response to the innocent inquiry about accommodations, stating that the "guests who feel most comfortable here, and return year after year, are Gentiles." Experiencing her first taste of overt anti-Semitism, 13-year-old Natalie Marx becomes instantly obsessed with the Inn at Lake Devine and the seemingly bigoted family that owns and operates it. Wangling an invitation from friends to stay with them at the inn one summer, Natalie embarks on a humorously enlightening 10-year odyssey, entangling the course of her professional and romantic destiny with the lives of Ingrid Berry, the rigidly implacable proprietor of the inn, and her two naive and attractive sons, Nelson and Kris Berry. Skillfully interweaving the bittersweet narrative with threads of both tragedy and comedy, Lipman displays a healthy amount of empathy and affection for her flawed and slightly eccentric cast of characters. (I haven't read this one, but saw it at the the librar, and it's now on my TBR list). From the author of the American Book Award-winning Stones for Ibarra (1984): a novel that limns in lapidary prose a story of loss and renewal in a small Mexican village--a town transformed by Americans inadvertently ``into something more beautiful than it is.'' As in an old morality fable--without the moralizing--Doerr tells of four expatriates driven to seek refuge in a place so unfamiliar that its ``otherness'' will be the catalyst that restores them. When ``two irresolute Americans'' arrive in tiny Amapolas, set in the midst of a barren mesa, and together buy ten acres from the local grandee, the villagers observe them with curiosity and tolerance. But recently divorced artist Sue Ames and her unlikely business partner, Bud Loomis (on the run from the Arizona tax authorities), have different reasons for making the purchase: Sue hopes to live there forever, and Bud wants to restore his finances. Realizing, though, that they can't afford their houses unless they subdivide the land, they sell plots to the 79- year-old Ursula Bowles, a recent widow, who was born in Mexico and now wants to regain ``the brilliant patchwork of her never-ending past,'' and her twice-divorced daughter, Fran, who wants a house so that her Mexican lover can visit her. 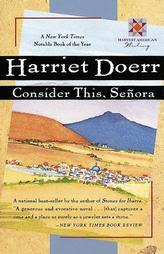 Over a period of five years, houses are built; droughts take their toll; locals in the Americans' employ prosper; and the four Americans begin to change: Sue realizes that she'd been too hasty in divorcing her husband; the now-dying Ursula accepts the loss of life and love (``an individual life is in the end nothing more than a stirring of air''); Fran, abandoned by her glamorous lover, meets a homely but dependable archaeologist; and Bud pays back his taxes and becomes a local benefactor. Wisdom and happiness prevail. A beautifully rendered novel in which the happy endings are more eloquent epiphanies than facile plot wrap-ups--and a second novel well worth the wait. 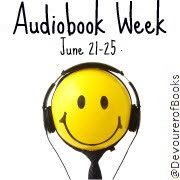 Today's assignment - share some of your favorite audio books with us. How about you? What are some of your favorite? Author - Jose Saramago R.I.P. Perfect Summer Reads ~ IMO of course!